The stepmother of fairy tale lore has often been painted as a woman who is driven to serve both the futures of herself and the prodigy she brings to the family of her new spouse. This drive for self-betterment usually results in neglectful actions taken by the stepmother against her new stepchild. These actions are often presented as the result of jealousy against the solace of the previous family. In reading several of the fairy tales that expressly target the stepmother trope, The Juniper Tree collected by Brothers Grimm, Vasilisa the Beautiful collected by Irina Zheleznova, The Mirror of Matsuyama collected by Yei Ozaki¸ and The Horse Gullfaxi and the Sword Gunnfoder collected by Andrew Lang, the reader of these tales are warned that jealousy a primary force in directing the actions of a wicked stepmother. The plot structure of a stepmother fairytale typically consists of the tragic death of the protagonist stepchildren’s mother. This leads to the father remarrying and the stepmother looking more favorably on her own children than that of the father. The favoritism of his own true progeny leads the stepmother toward “competing with her stepchildren” over that favoritism and reveals her jealousy of the past experience to the reader (Williams 260). Thus begins the “cruelty to her new husband’s” children (260), usually towards actions, magical or otherwise, that leads the child to become embroiled in grisly danger. One differing factor from the summary, though not uncommon, is the actions of the stepmo﻿ther from The Juniper Tree ﻿﻿are shown to be caused by an outside for﻿ce that arises from her most expressive trait in the tale, anger. When she orchestrates the death of her stepson, “the Evil One prompted her” (2) instead of her rage being the catalyst of his demise. The Evil One allows a distancing of the jealous actions of the stepmother, even though she does suffer the consequences of those actions with her demise in the final sentences. Terror of the outcome is the final trait expressed by this stepmother. Under the supernatural assault of the bird that perches atop the juniper tree, the stepmother “was terrified” and “fell down on the floor in the room” (6). She only thinks of her success and it would have been a true success had the magical aspects of the fairy tale not been employed. Marlene would be committed. The father would long for the murder stew. And the stepmother would have gotten away with a horrible act unpunished. The stepmother of Vasilisa﻿ the Beauti﻿ful, a fairy tale from Russia, possesses a similar cruelty, though the drive is more the love of her daughters over that of her new stepdaughter. “The stepmother loved them dearly and was always kissing and coddling them” (Zheleznova 1). She did not include Vasalisa in such loving matters, instead making her stepdaughter the focus of her jealousy. Hard labor was her cruelty of choice over the fashioned beating employed in The Juniper Tree. The stepmother, along with her favored daughters, forces Vasalisa into an involuntary enslavement, with commands to “fetch the wood” and “start a fire” (1). While these actions are not as harmful and not nearly as petrifying, the physical and emotional toll being under such an authority wears at Vasalisa over time versus the death of the stepson in The Juniper Tree. Vasilisa’s stepmother and stepsisters are merely an early antagonist of the fairy tale, the horrible motivations that set her on a path toward both direr and, eventually, better circumstances. However, even with a small appearance in the story, she does not escape the terror of her actions much in the way of the earlier The Jupiter Tree stepmother. 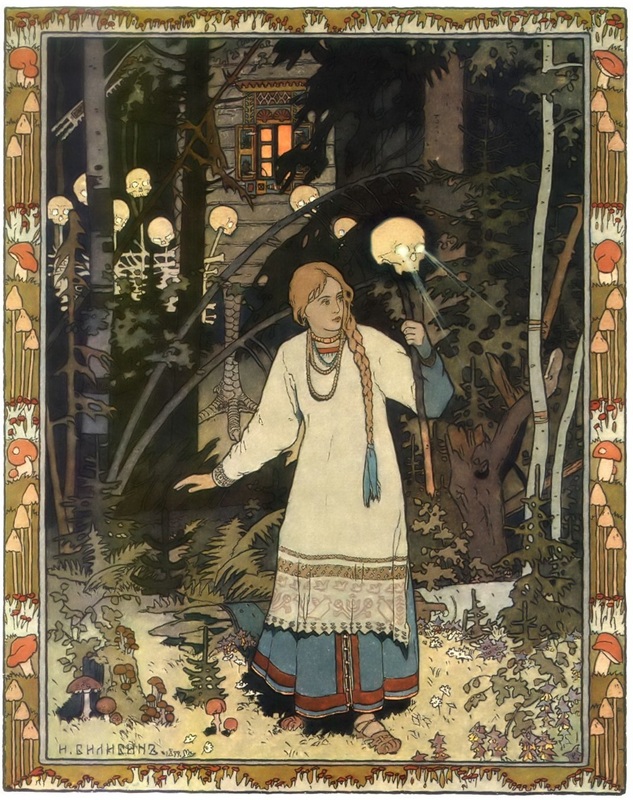 A series of events with the witch of the story allows Vasilisa to return with the undoing of her wicked stepmother, a skull, whose “eyes fixed themselves on the stepmother and her two daughters and burnt them like fire” (9). 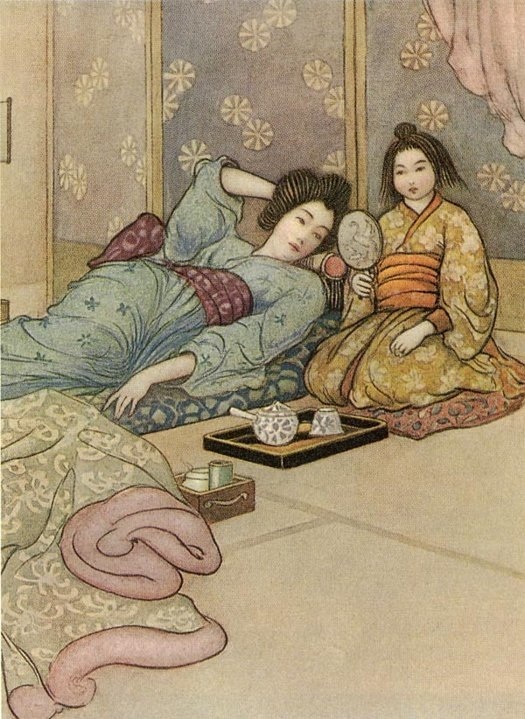 The ﻿Mirror of Matsuyama﻿, a fairy tale of Japan, seems to negate the majority of the plot tropes of the two previous fairy tales. Yes, there is a cruel stepmother that has arisen in the wake of a mother’s death. But the motivations and cruelty of this stepmother differ though the wants desired and the actions taken in the fairy tale to get them. This fairy tale does not have a supernatural aspect to it, making it unique in the four stories examined. There is no death for the stepmother at the end. Instead, the recognition of the cruelty the stepmother used enacts the happy ending for the new family, “the young girl gradually forgot that year of unhappiness in the tender love and care that her step-mother now bestowed on her” (10). No one needs to die because “the three lived together as happily as fish in water” (10) and the stepmother replaces her jealousy with love. This aligns with driven jealousy enacted by stepmothers from other fairy tales. In Cinderella, the stepmother is cruel because she “wants to foster her own offspring” (Gonzalez 203). Similarly, in Snow White, the stepmother is jealous “over the princess’s youth and supposedly superior beauty” (203). The Mirror of Matsuyama continues this tradition of jealousy, enabling the actions of a cruel, and eventually relenting, stepmother. In ﻿The Horse Gullfaxi and the Sword Gunnfoder﻿, a fairy tale of Iceland, there is no wicked stepmother. The mother dies and the father remarries the sister of giants Ingiborg and the stepson ﻿Sigurd﻿ adores her. So much that he “would rather stay home” (1) with her than go hunting with his father. 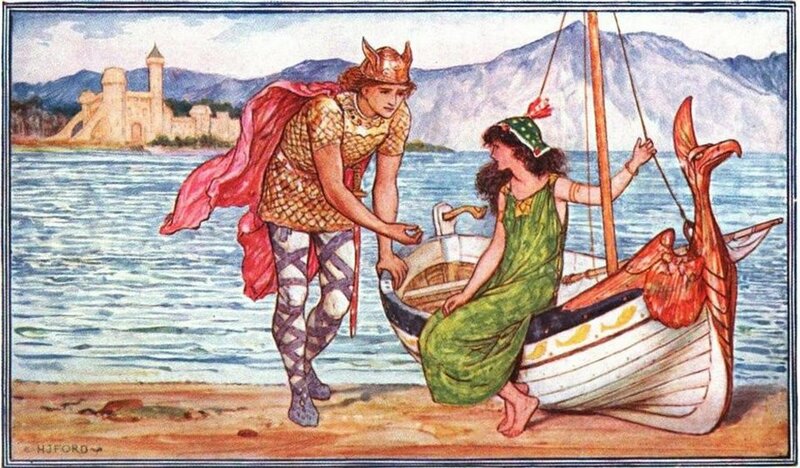 This insubordination of Ingiborg’s wishes happens multiple times in the story and while it draws forth her anger at Sigurd’s stubbornness, she does not lash out at him in a cruel fashion. After facing those trials, Ingiborg’s kindness is repaid by her stepson. Thinking that his new wife has killed his beloved son, Ingiborg is nearly killed before Sigurd saves her. It is the inverse of the typical stepmother death at the end of the tale shown in The Juniper Tree. This is a good stepmother fairy tale and everyone is allowed to live happily ever after at the end. All of the attributes attached to the wicked stepmother do not intersect all of these tales. Two of our stepmothers are stereotypically wicked at the end of their tales, though they do not share all the traits between them. The Juniper Tree stepmother is driven by finding her place and future within the hierarchy through the use of anger driven actions that can be blamed on the devil. The stepmother of Vasilissa the Beautiful attempts to grasp much the same for herself and her daughters through her cruelty. Both die horribly for that cruelty even with the differing degrees of their actions. The remaining two stepmothers (The Mirror of Matsuyama and The Horse Gullfaxi and the Sword Gunnfoder), exhibit traits of good. Though with Matsuyama, it takes a bit of a trial before this happens, both tales break the idea of a stepmother always having to be evil. Jealousy, however, rears its head through three of these tales. Gunnfoder aside, jealousy of the former life her husband possessed seems an unavoidable impetus if a fairy tale requires a stepmother’s wickedness. Matsuyama seemingly states this outright with its narrative and Gunnfoder’s stepmother is virtuous with her stepchild because she does not possess it. Likewise, Juniper, Vasilisa, and other wicked stepmother fairy tales are reminder that those who hold resentment to those in their care are capable of immeasurable harm and, often, a dire punishment returned in kind. González, Margarita Carretero, and María Elena Rodríguez-Martín. "Wicked Women: The Menace Lurking Behind Female Independence". At The Interface / Probing The Boundaries 57. (2009): 199-209. Communication & Mass Media Complete. Web. 28 February 2015. Jacob and Wilhelm Grimm, Von dem Machandelboom, “The Juniper Tree." Kinder- und Hausmärchen (Children's and Household Tales -- Grimms' Fairy Tales), Grimm 047. Translated by D. L. Ashliman. 2002. Web. 28 February 2015. Lang, Andrew. “The Horse Gullfaxi and the Sword Gunnfoder”. The Crimson Fairy Book. Lit2Go Edition. 1903. Web. 28 February 2015. Ozaki, Yei Theodora. “The Mirror of Matsuyama”. Japanese Fairy Tales. Lit2Go Edition. 1908. Web. 28 February 2015. Zheleznova, Irina Lʹvovna. “Vasilisa the Beautiful; Russian Fairy Tales”. Moscow: Progress, 1966. Web. 28 February 2015.